Picuris Pottery of the Picuris Pueblo, of North Central New Mexico, alongside the Rio Grande River Valley, was named, 'Pikuria,' meaning - "those who paint," by Spanish colonizer Juan de Oñate. Picuris is located approximately twenty-five miles southeast of Taos, New Mexico, in the Sangre de Cristo Mountains. Picuris was once the largest in population of the New Mexico's Eight Northern Pueblos, but today is one of the smallest Tewa speaking Pueblos, with approximately two-thousand inhabitants. Like Taos, Picuris Pueblo was influenced by Plains Indian culture, particularly the Apaches. 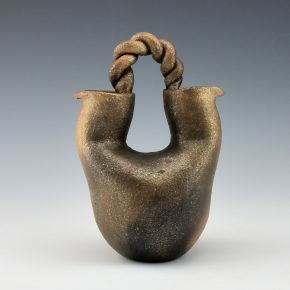 Picuris pottery is often made in the form of functional micaceous clay vessels, and are recognized by their beautiful, almost metallic shimmer in appearance. 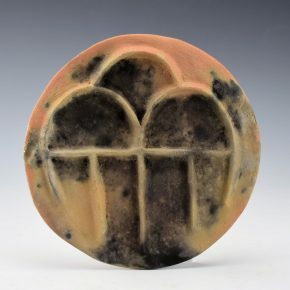 This type of pottery is utilitarian by design, and usually is not decorated or painted on the outside of the vessel, but beautiful shapes, micaceous clay, and fire-cloud reflect the beauty of an ancient art form that has been carefully preserved. Kimberly Riley Honyumptewa is from Laguna Pueblo and married to Aaron Honyumptewa who is Hopi/Picuris. She learned to make pottery from her mother-in-law Caroline Simbolo Cine in the traditional Picuris style and using native clay from the area. Each piece is coil built and traditionally fired. This wedding vase is a creative shape with the twisted handle and the organic flow of the spouts. The vase has a darker coloration from the fire clouds but the mica shows through beautifully! The vase is signed on the bottom. Kimberly’s work continues to evolve in creating more dynamic Picuris pottery! Kimberly Riley Honyumptewa is from Laguna Pueblo and married to Aaron Honyumptewa who is Hopi/Picuris. She learned to make pottery from her mother-in-law Caroline Simbolo Cine in the traditional Picuris style and using native clay from the area. Each piece is coil built and traditionally fired. 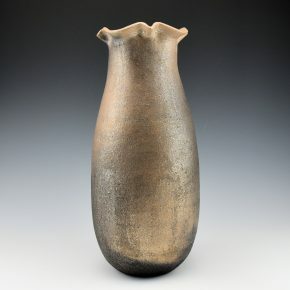 This is one of the largest pieces we have had of her pottery. It is round near the base and the rim is fluted and sculpted. 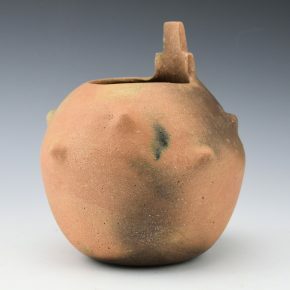 The jar is an elegant shape and the firing is striking. It sets off the black, gold and various hues of the micaceous clay. The jar is signed on the bottom. Will be exciting to see how Kimberly’s work continues to evolve in creating more Picuris pottery!